Directed by Ian W Thomson. Australia. 2014. 69 mins. 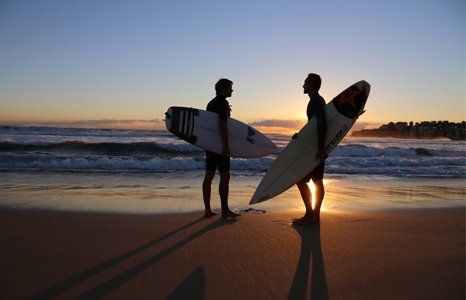 OUT in the Line-up follows Australian surfers David Wakefield and Thomas Castets as they embark on a journey from the east coast of Australia to Hawai‘i, California, Mexico and the Galàpagos Islands to uncover the taboo of homosexuality in surfing. Throughout their travels David and Thomas hear stories of fear, isolation and self-doubt, but are also inspired by tales of hope, self-empowerment and transformation. As their journey unfolds, David and Thomas hope to create change in surf culture, looking to surfing’s grassroots values of freedom of spirit, open-mindedness, and love for the ocean. Surfing is an expression of freedom for women around the world, but what happens when the media and larger culture of sexualization threaten to take that freedom away? Irish big-wave surfer Easkey Britton became the first woman to surf off the coast of Iran in 2013. This is her story.